What a long way Deeqo Jibril has come—from fleeing a civil war in her home country of Somalia at the age of 12, to hosting an iftar (a meal to break the fast during the Muslim holiday of Ramadan) with leaders of the Boston Police Department and the FBI. She definitely has; in fact, Jibril is one of the 2016 winners of the Dorothy Richardson Resident Leadershp Award. The youngest of five children, Jibril got her strength in part from her mother, who refused to follow tradition and marry a brother or cousin of her husband. Instead, her mother worked hard by selling crafts and earned enough to send Jibril’s two older sisters to the United States to study. But then the civil war broke out; the president fled and chaos reigned. One’s tribal identity determined whether you lived or died. Terrified, her mother gathered up the family and fled to Kenya in the middle of the night. Fortunately, the two sisters already in Boston were able to secure visas for the rest of their family to join them. But Jibril didn’t know a word of English and the future felt very uncertain. Her older sisters were her guides and role models, and fortunately, Jibril and her family found a welcome home in the apartments run by NeighborWorks member Urban Edge. After a year in community college, Jibril married a Somali man who proved to be as repressive as her culture back home—resulting in a divorce that left her a single mother of four. Nevertheless, she went back to school and has nearly completed her university degree in human services, intent on “giving back” to her new home. Her jobs have included working as an interpreter and a case worker who found housing for homeless families. It was around the time of her 2010 divorce, however, that her entrepreneurial spirit flowered. What a long way Deeqo Jibril has come—from fleeing a civil war in her home country of Somalia at the age of 12, to hosting an iftar with leaders of the Boston Police Department and the FBI. Thus, the Somali Community and Cultural Association was born. In 2015, when an FBI agent shot and killed a Muslim man in front of a mosque in Roxbury, Jibril worked to bring the community together and focus on positive next steps. Jibril organized a dinner with members of the Muslim community and members of law enforcement. She created a safe space for the dialogue needed to cope with the trauma and prevent violent reactions. The event was attended by nearly 200 members of the community. 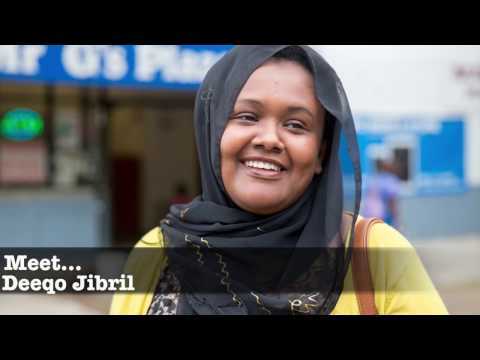 As word of her work spread, Jibril was invited to represent the Somali community at a White House summit on the prevention of radicalization, and in a meeting with the Department of Homeland Security, Jibril’s work took another direction when she visited Minneapolis, called “Little Somalia” because of the large population of immigrants and refugees from the country. While there, she found a mall entirely consisting of Somali businesses. And that gave her an idea. Such a mall also existed in other cities with Somali communities—including Seattle and Columbus. Why not Boston? When she returned home, she recruited and raised money and opened the African Mall in Roxbury. No wonder Jibril was recognized by the Massachusetts Commissioner on the Status of Women as an "Unsung Hero."